You don’t have to be in our Colorado long to notice the growth and cranes everywhere. In the Sloan’s Lake neighborhood developers are working hard to find the balance between the old and the new. For some Coloradoans, change is right across the street. DENVER — You don’t have to be in our Colorado long to notice the growth and cranes everywhere. In the Sloan’s Lake neighborhood, developers are working hard to find the balance between the old and the new. For some Coloradoans, change is right across the street. 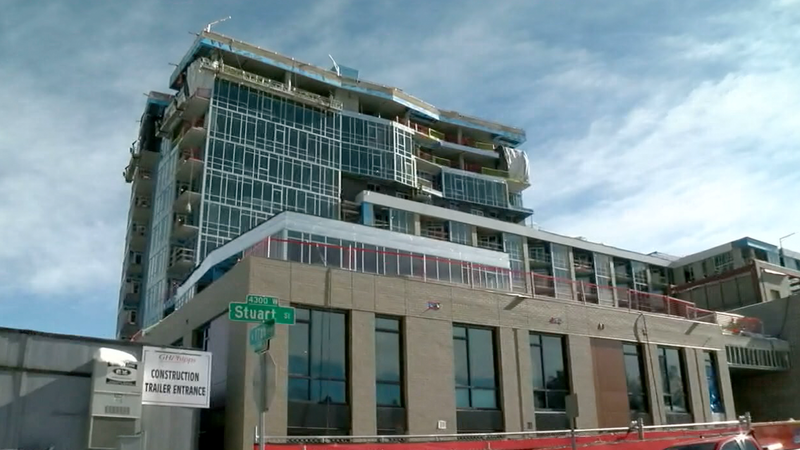 Developer Cameron Bertron, with EnviroFinance Group, LLC is transforming the old St. Anthony’s Hospital campus into a master-planned community at Sloan’s Lake. There are a mix of residential projects spread out over the nearly eight block location. High end condos like the Lakehouse on 17th start at a little more than $500,000. NAVA developer Brian Levitt designed his units focused on wellness. “A lot of people that want home ownership and the opportunity to live with views of the mountains and the lake but also be close to downtown,” said Levitt. A few blocks away, there are new restaurants, retail spaces and a new movie theater. But with all this development, some worry the already pricey cost of living will continue to rise like Denver resident Lindsay Sullivan. That’s where Bertron said their development will help fit the needs of different kinds of people. He told Denver7 one in every five of the 1100 units will be affordable housing, including a new senior facility. Maintaining some of the history, literally repurposing the old nurse living quarters, was key. “This is the chance for them to stay in the neighborhood that they’ve been in their whole life. So you can’t solve everything for everybody but we tried as deep as we could,” said Bertron.